The Intel P35 chipset's status as the weapon of choice for overclocking slaps on it perilously lofty expectations. It's easy to forget that it's a mainstream chipset. The same logic applies to MSI's P35 Platinum board. 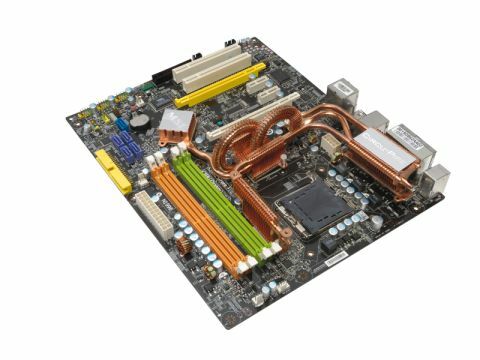 This is a sub £100 mobo that nevertheless packs quite a solid feature set, including support for the latest 1,333MHz Intel processors and quality copper cooling for the chipset. Notably, MSI has also plumped for the DDR2 rather than DDR3 memory support, which arguably makes more sense at this price point. The existence of Asus's P5K3, flattens the P35 Platinum for raw overclockability, though. Granted, a bus speed of 475MHz is far from poor. But the extra 50MHz the Asus achieves crucially maximises the performance of Intel's cheaper Core 2 chips.